So you’re looking for a sample bartender resume? 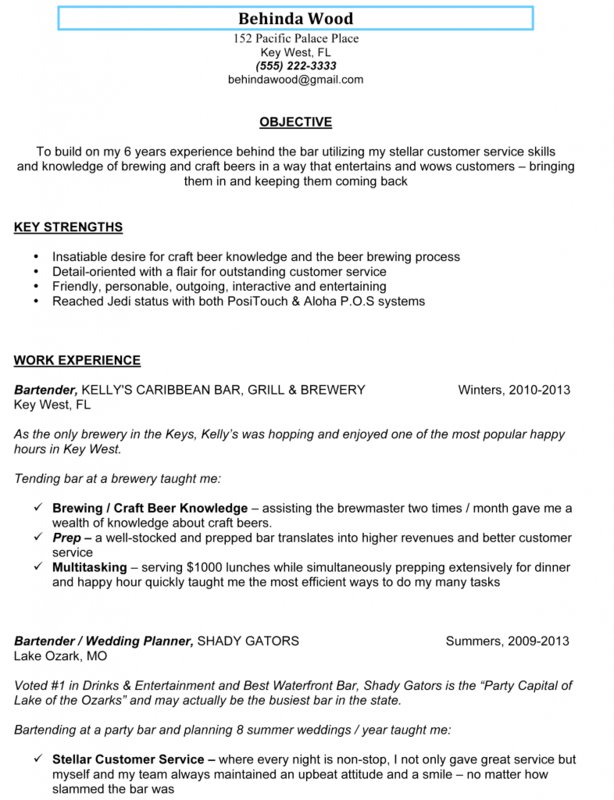 Great, that’s what we’ve got for you – a couple examples of a bartending resume. Note: some people call a bartending resume a bartending CV or curriculum vitae, but it’s really not. The basic difference between a resume and CV is the length and breadth of what’s covered in a CV compared to a resume. If you’re trying to create a great bartending resume, take a look at the sample bartender resume below to give you some ideas on what to write as well as how to write your own. This sample bartender resume outlines the most important aspects and sections of a bartenders resume. Depending on your level of experience, education and skill set, you’ll want to start your bartending resume with whatever looks the best. This means that if you have a lot of certificates – bartending, mixology, draught pouring, sommelier etc – list these first under the heading “Education”, “Special Skills” or “Certification”. YOUR BARTENDING RESUME WRITTEN FOR YOU! If you’ve looked through all our helpful hints, tips and strategies on how to write your own bartenders resume but you still don’t feel confident enough to write your own – then DON’T! Get a professional to write it for you. Reese Richards will write your bartending resume personally. As the only brewery in the Keys, Kelly’s was hopping and enjoyed one of the most popular happy hours in Key West. Brewing / Craft Beer Knowledge – assisting the brewmaster two times / month gave me a wealth of knowledge about craft beers. Voted #1 in Drinks & Entertainment and Best Waterfront Bar, Shady Gators is the “Party Capital of Lake of the Ozarks” and may actually be the busiest bar in the state. If you have trouble, however, then don’t go and hand out poorly written resumes – you’ll be wasting your time and effort and you’ll be closing doors for places where you’d really like to tend bar. Instead, have a professional – like the founder of BarsandBartending.com – write your bartending resume for you. 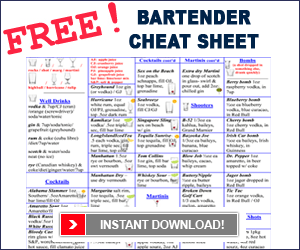 Don’t forget to check out the other bartending resume resources below and leave a comment if you found this information useful. Check out other related pages on Landing a Bartender Job. What to do before the interview, during the bar interview, and after the interview. And also, what to wear to the interview.